AHEAD of International Women’s Day on March 8 this year, The St. Regis Abu Dhabi invited Abu Dhabi’s most influential female leading women to an exclusive all-female session of inspiring conversation and idea exchange, hosted by two international guest speakers. The event took place at the prestigious Abu Dhabi Suite, the world’s highest suspended suite located on the 48th and 49th floor of The St. Regis Abu Dhabi, to elevate Abu Dhabi’s female luminaries to new heights. Together with two guest speakers from London, Janette J Sinclair and Alicya Sinclair, the workshop format event invited to discuss personal future management after breaking the glass ceiling as well as how to dress to impress in the professional career. To enhance social networking, all guests were part of the ‘Queen of Hearts Afternoon Tea’ debut, a St. Regis timeless tradition that is exclusively available at The St. Regis Abu Dhabi in celebration of International Women’s Day this March. All guests were invited to discover the famous pastime of the St. Regis brand’s matriarch Caroline Astor – luminary of her time and one of the most influential women of the 20th century. Perfected through her legacy and reimagined by the hotel’s highly skilled pastry team, the Queen of Hearts Afternoon Tea showcases freshly handcrafted sweet and savoury treats inspired by today’s female luminaries and icons of modern society. Janette J Sinclair is a chartered member of the CIPD (MCIPD) & QSCA Certified Life Coach at Synclarity Coaching Practice. 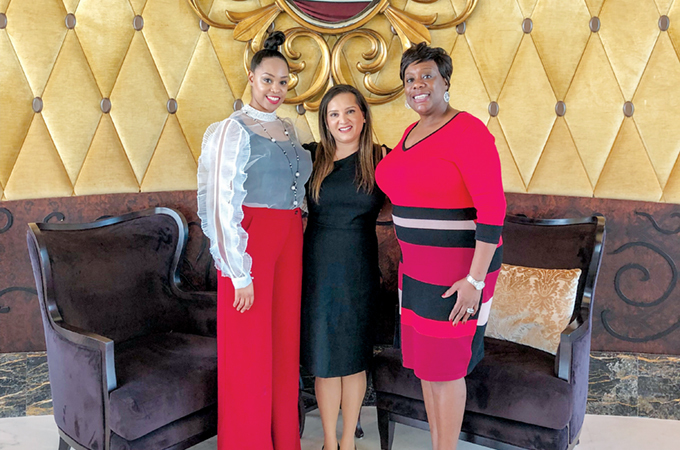 As first guest speaker for the ‘Connecting Women’ event debut, she said: “I have always had a passion for people, talent development and personal growth. Being the first guest speaker for this event debut at The St. Regis Abu Dhabi makes me proud and I am happy to inspire Abu Dhabi’s leading ladies to a challenge and to stretch themselves to be the very best they can be!” Janette’s experience, understanding and knowledge is drawn from several positions both in the publishing world at The Readers Digest and at IBM. She has helped to close multimillion-dollar deals, as well as delivering significant improvements to revenue and cost. Janette is a mother of two grown daughters. Alicya Sinclair, one of her daughters, was the second guest speaker of the event. More than 50 celebrated female leaders across several industries shared their successes and challenges. The debut of Queen of Hearts Afternoon Tea was a great success in bringing women together.